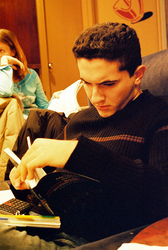 English Tutor Eric Anderson of I-Tutor-English.com suggests several free resources to students preparing for the SAT. In addition to tutoring or a prep course, students should sign up for College Board's SAT Question of the Day and do the free tutorials on Number2.com. "Although standardized tests are only one of the many things considered by colleges and universities in making a decision to admit a student," said Tampa SAT Tutor Eric Anderson, "they are an important part of the mix, especially for those who are applying to larger schools." Anderson believes that one-on-one tutoring is the best way for students who have not achieved the scores they need to improve rapidly. "The classes given by national test preparation companies are excellent, but sometimes they move too quickly over material that a particular student is struggling with," said Anderson. Several of Mr. Anderson's students have scored impressive gains. One recent student raised her score on the writing portion of the SAT 150 points as a result of taking individual classes. His company offers individualized, in home tutoring to students in New Tampa, Wesley Chapel, and the surrounding areas. To contact Eric Anderson or learn more about I-Tutor-English.com, call 813.787.8959.